IN THIS REISSUED PAPERBACK EDITION WITH A NEW EPILOGUE, CARL ZIMMER REVEALS THE POWER, DANGER, AND BEAUTY OF PARASITES. For centuries, parasites have lived in nightmares, horror stories, and the darkest shadows of science. In Parasite Rex, Carl Zimmer takes readers on a fantastic voyage into the secret universe of these extraordinary life-forms—which are not only among the most highly evolved on Earth, but make up the majority of life’s diversity. Traveling from the steamy jungles of Costa Rica to the parasite-riddled war zone of southern Sudan, Zimmer introduces an array of amazing creatures that invade their hosts, prey on them from within, and control their behavior. He also vividly describes parasites that can change DNA, rewire the brain, make men more distrustful and women more outgoing, and turn hosts into the living dead. 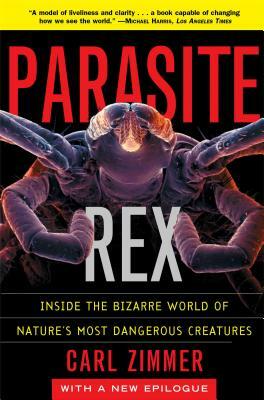 This comprehensive, gracefully written book brings parasites out into the open and uncovers what they can teach us all about the most fundamental survival tactics in the universe—the laws of Parasite Rex. Michael Harris Los Angeles Times A model of liveliness and clarity...a book capable of changing how we see the world. Kevin Padian The New York Times With Parasite Rex, Zimmer proves himself as fine a science essayist as we have. Mark Ridley The New Scientist A nonstop delight...Zimmer is a colorful writer, and takes full advantage of the macabre natural history of parasites. Susan Adams Forbes Zimmer is such an accomplished, vivid writer that he is able to weave these revolting beasts into an engrossing story that you will read to the last page.